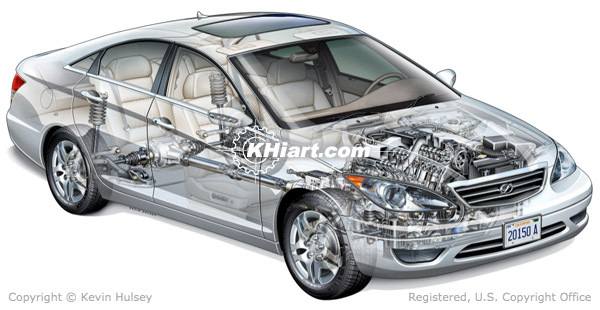 This portfolio contains ghosted and cutaway illustrations of generic car systems and sub-systems such as the the electrical system, exhaust system, cooling system, air conditioning system, abs braking system, driveline and suspension system. This image is an illustration of a generic car electrical system diagram with the main wiring harness, electrical connections and plugs, interior and exterior lighting, heated rear-view mirrors, window defrosters, computerized engine management systems, 12V battery and alternator, fuses and relays, and miscellaneous electrical components. 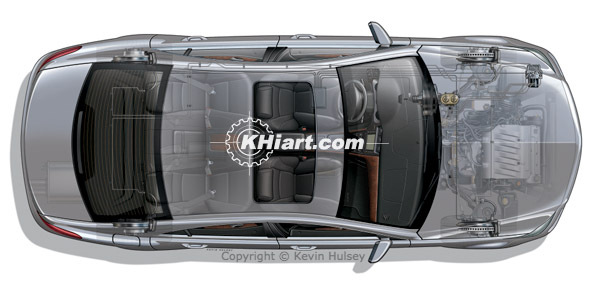 This Photoshop layer is part of the 2012 generic car cutaway shown at the top of this page. 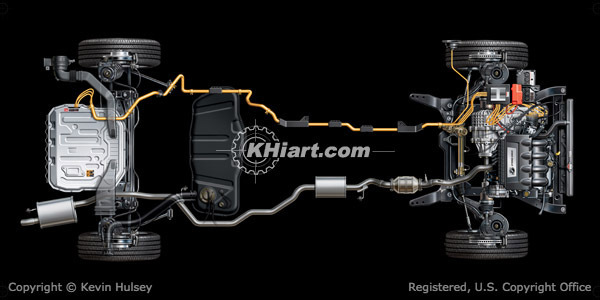 This Photoshop layer shows catalytic converter, muffler, exhaust pipes and exhaust manifold incorporated into the vehicle's chassis driveline. The entire exhaust system can be isolated on its own individual layer. This overhead diagram shows a passenger car ABS system with wheels, disc brakes, plumbing hoses and hydraulic brake lines, anti-lock-brakes wheel sensors, actuator, computer controller and electrical wiring. 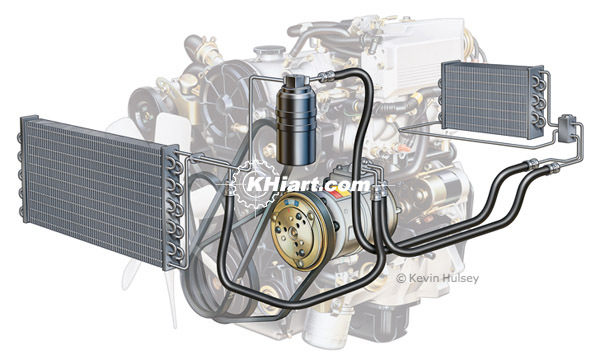 The image above is a ghosted illustration of a generic passenger car engine with the entire automotive air conditioning system, showing the compressor, A/C pump, condenser and hoses. 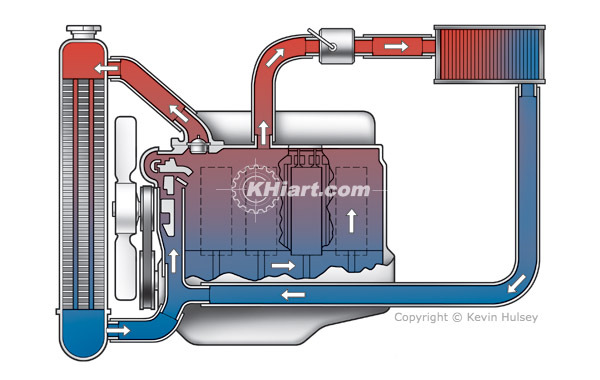 This section-view engine diagram shows the coolant flow through the engine's water jacket, radiator and interior cabin heating element. 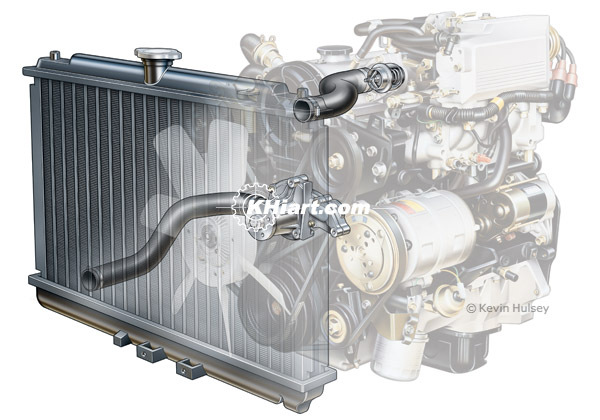 This next image is a generic car engine with the engine cooling system, showing the radiator, thermostat, water pump and hoses. 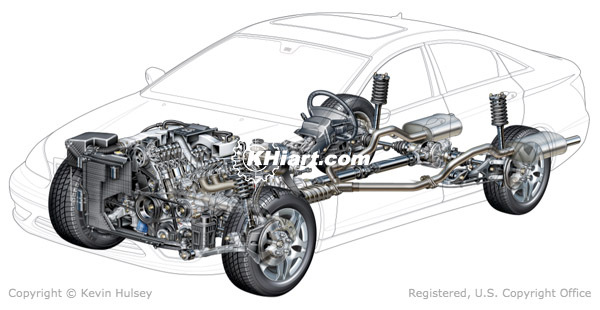 This overhead diagram shows a passenger car's exhaust system, catalytic converter, mufflers and exhaust pipes incorporated into the vehicle's driveline. 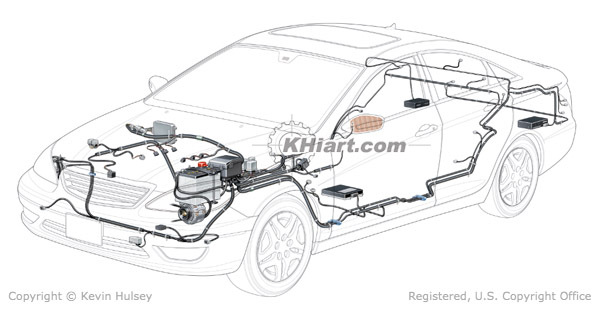 This illustration shows a passenger car's anti-lock braking system with disc brakes, hydraulic brake lines, wheel sensors, brake actuator and brake booster with master cylinder. 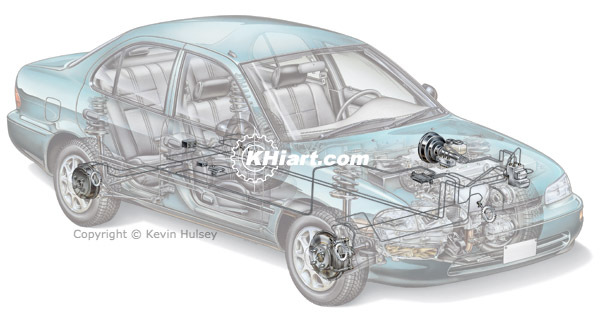 This ghosted illustration shows an economy passenger sedan's ABS system through a faded exterior body. 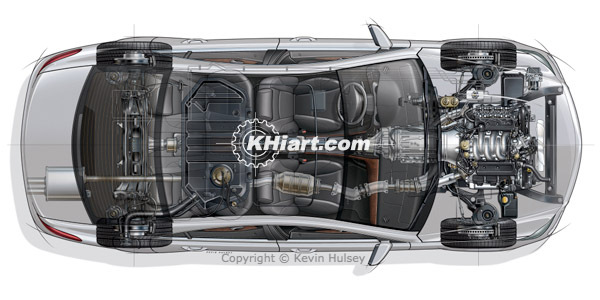 This diagram depicts a hybrid car's exhaust system with its catalytic converter, mufflers and exhaust pipe.